Rock Salt Lamp VITAMIN OF THE AIRDimension : D-7.2",H-4.2" Inches Approx.Weight : 3-5 kgIn th..
Dimension : D-7.2",H-4.2" Inches Approx. 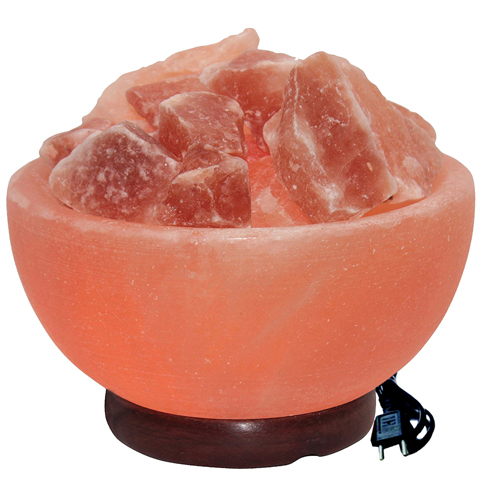 In the world of science Rock Salt Lamp, as it enriches the surrounding air with therapeutic values, is known as VITAMIN OF THE AIR. The atmosphere around acquires not just a beautiful glow but oozes with immense health benefits. It is the best available Natural Ionizer. 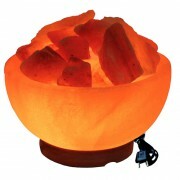 The negative ions produced by the lamp help to ease the effect of fatigue and counter EMP (electromagnetic pollution) effects from computer, electronic equipment etc.…thus bring relieve from mental exhaustion and improve sleeping pattern consequently helpful for those suffering from insomnia, migraine, irritant behavior and depression. It is effective against airborne bacteria and viruses, thus found especially beneficial for people suffering from allergies, respiratory/breathing and skin problems like sinus, bronchitis (asthma) and eczema etc. It’s ionizing and counter EMP (electromagnetic pollution) properties, collectively enhancing the body’s absorption and utilization of oxygen, thus assisting concentration and alertness. For all these reasons, it is a preferred choice in many of the alternating healing systems like reiki, pranic healing etc. We can place it in our workplace/office, bedroom, study room, meditation / massage rooms, hospital / recovery rooms. Due to its hygroscopic properties (absorbing moisture from the air), it is advisable to avoid using the lamps outdoors or in the damp rooms. It is maintenance free and easy to use.